I promised myself I would make birthday cakes much simpler ever since my Elmo cake saga. Though this experience was simpler, it still was A LOT of work. But I keep learning and every time I make a new creative cake, I learn ways to make it easier for the next time. This time around, I finally made a cake frosting I can be proud of, a sugar-free birthday cake buttercream frosting!! The icing you see here, in this picture is completely sugar free. It's made with honey and stevia and NO, it does not taste like bitter stevia nor does it taste like the distinct honey taste. It's sweet and smooth, just like your ordinary American buttercream frosting. I also finally, after a year of trial and error, nailed my gluten free vanilla cake. So, this post is special. Two special recipes to share with you. Although I might post my buttercream frosting recipe in a couple of weeks when I have more time to show you more examples of what it can do. I made this vanilla cake so many times. Like 30 times. Maybe more. Some people call it perfectionism, some call it dedication and others call it straight out CRAZY. (husband M). I tend to agree with all of these, especially the latter one since sometimes it takes a little dash of crazy to make things work out, right? So after making Elmo, I was going to call my vanilla cake recipe Lucky 18 Vanilla Cake because I had made 18 cakes at the time, but now it's more like 33, and Lucky 33 Vanilla Cake doesn't sound good. But both are better than my original title F*cking Vanilla cake which was actually my first choice after throwing out x amout of expensive failed cake attempts. I also have to mention my son. Smiley baby has just turned one, so he's now Smiley Toddler and my other toddler is now a kid, Kid N.
These kids grow up fast. And what a nice little party we had for Smiley Toddler. I love kid parties! I love getting all our friends together to catch up on life and watch our little ones play (and sometimes) fight together. Please read recipe and all instructions thoroughly. Beat egg whites until they form peaks then stream oil into it, while whisking. Set aside. Beat softened butter until fluffy, add sugar. Add egg yolks and beat mixture until batter is smooth. Add milk, vanilla, glycerin and stevia. Beat for a solid 10 minutes to dissolve sugar. Add dry ingredients a spoonful at a time, incorporating slowly (you don't want to flour to puff up into the air). When all ingredients have been blended, beat batter until well mixed. Add egg whites and oil mixture and beat on low setting until smooth. Outline and cut a circle out of parchment paper then line 9 inch round pan with it. Pour batter and smooth with spoon. Bake at 325 degrees for 50-60 minutes, depending on your oven. Remove when springy in the middle and golden brown. Let cool in pan for 5 minutes then remove cake from pan. Let cool on wire rack with clean dish towel covering the entire cake. Wrap with plastic wrap once cooled and place in fridge for frosting. Will keep for a good 5 days in the fridge. *UPDATE: I prefer not the refrigerate this cake as it becomes dense when cold, I prefer it light and fluffy so instead I wrap it in plastic wrap and leave it on the counter. *Do NOT substitute another flour for coconut flour! The amount of coconut flour in this recipe is undetectable in taste. It's a beautiful flour that will give this cake a great taste and texture without the strong coconut taste. I promise, anyone who hates coconut will NOT taste it in this cake. Also, you should know that coconut flour is difficult to cook with, all measurements are made to suit the proper ratios of this cake using coconut flour and any changes can result in a Bad cake. Every ingredient in this recipe has been tested so trust me that this recipe works. Also do NOT substitute Agave or liquid sugars for the granulated organic sugar. It will not work. ** Glycerin is an option, but a nice one. You can buy it at Michael's. Make sure it's vegetable based and edible. Ask a clerk to make sure you are buying the right product. 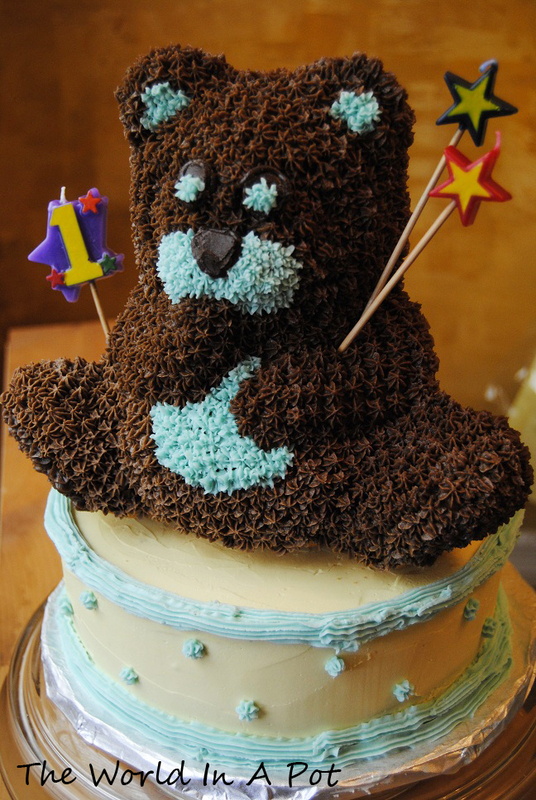 Release this cake from the wilton cuddly bear pan was tricky. Half of the back of the head detached itself because it was stuck to the pan. It was easily remedied with frosting used as glue, then the entire bear was sealed with plastic wrap, returned to the cake pan then frozen in the freezer. 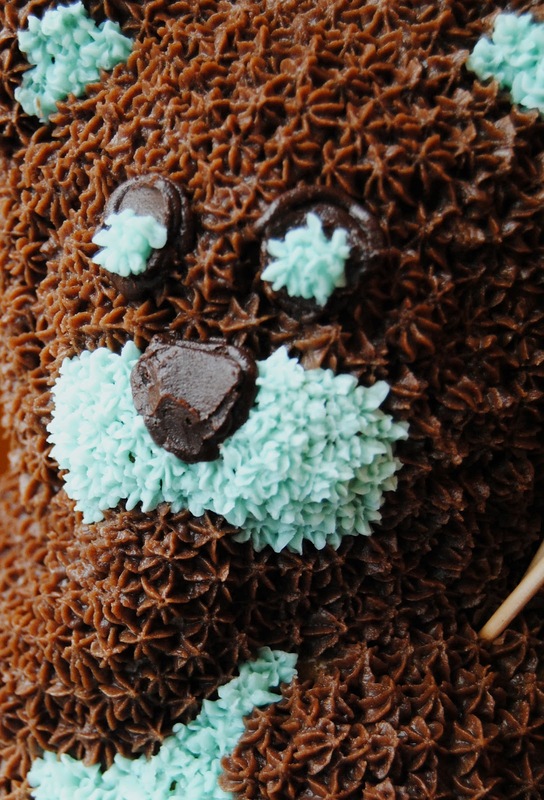 Then next day, when I had defrosted it in the fridge, I cut a piece of bbq squewer and placed it in the back of the head to pierce the glued-on (with frosting) pieced of broken bear head to the intact bear. It stayed in place as was perfect for the party! I kept the bear in the fridge for as long as possible to prevent the frosting from melting and thus having the bear fall apart. Also, if using the wilton bear cake pan, bake for 1 hour and 10 minutes and double the recipe. Don't use all of it, follow instructions and use 7 cups of batter. I also made one chocolate layer of cake for the cake base, since everybody loves chocolate. I used my I Love You Chocolate Cupcake recipe and added 1/2 Cup sour cream. Do not double the recipe- bake separately. 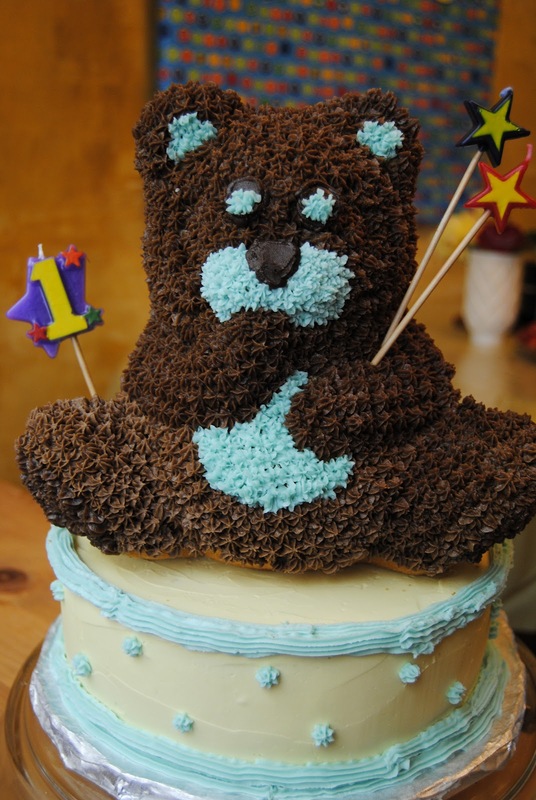 This wilton bear cake requires 3 cups of buttercream frosting to cover entirely and the 2-layer, 8 inch cake base Cake requires 3 cups of frosting if using a crumb coat (which I highly recommend!). A crumb coat is a thin coat of frosting applied on the refrigerated cake to prevent crumbs from appearing on the final coat of frosting. You can see a picture of a crumb coat on my Elmo post here. Here's a close-up of my new American icing/buttercream frosting. I will post it as soon as I have more pictures of this delicious sugar-free frosting. It was a blast making this for my one year old son. I hope you enjoy it too. I've submitted this cake for the birthday Cake challenge over at Daily Dietribe. Check it out! Wow, that is amazing! I am so impressed! Thanks for joining the cake challenge! Thanks! and thanks for hosting it! What a beautiful cake! Thank you for sharing the recipe. Hi, can I substitute apple sauce for the oil portion and not ruin the cake?? Thanks. I haven't tried it with apple sauce, but I think it would. Adding liquids like honey ruins this cake so I'm assuming the apple sauce would. My husband was recently diagnosed with an aversion to gluten, which is a lot better than some of the "other" diagnoses he has had over the years. Just as soon as I have GF baking down, he will most likely be diagnosed with something else to cause havoc in my kitchen. So,it is my husband's birthday and Lucky 33 seems like the perfect cake for my 63 yr old. Wish me luck! Good luck Nana!! If he likes chocolate, you should definitely try the cupcakes, It's a sure winner! Let me know how it turned out! Lovely cake! Why not olive oil?